Last night, there was a new movie premiered in HBO Asia as its usual Saturday Night Premiere program. It was a movie that never played in Indonesian cinemas last year. I remembered reading somewhere that the critics quite enjoyed this one but the audience did not like it and so I was truly intrigued to give this a try. Since my wife and I did not have any plan for the night, we were already at home at 8 PM when the movie started. But as she was not a fan of such film, I saw this one by myself. A Poet (Javier Bardem - Pirates of the Carribbean: Salazar's Revenge, Vicky Cristina Barcelona etc) was living with his wife who was referred to as mother (Jennifer Lawrence - Red Sparrow, American Hustle etc) in a house which seemed to be in the middle of nowhere. Mother was very much in love with the Poet and was willing to build the Poet's house which was completely burnt down earlier. Meanwhile the poet was having some writer's block and could not seem to write a new poem. Their peaceful life however was disturbed when a man (Ed Harris - Westworld TV series, The Rock etc) who claimed to be the Poet's fan suddenly came at night and Poet asked him to stay for the night without asking his wife's approval. Things become a bit problematic when the following day the man's wife (Michelle Pfeiffer - Murder on the Orient Express, Hairspray etc) also came to the house and was being asked to stay at their house. Pretty soon other people started to come to their house, disrupting the peace. Mother who was disappointed in her husband for the disruption also found some peculiarities in their house. Just when things seemed to be getting worse for her, something else happened to them that would change their fate. How would the things unfold? Find them all in this psychological horror movie. This was a movie which was what I expected. Because I already knew that it was a psychological horror, the expectation was naturally something that we could guess would be terrorizing the main cast. 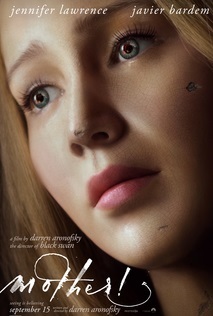 In here the person who was being mentally terrorized was Mother (who was portrayed quite convincingly by Jennifer Lawrence who seemed to have a knack for playing emotional/non conventional character). And Javier Bardem was also outstanding here as the Poet who was being worshiped by people and having difficulty to choose between such "love" and the love from his wife. At first the movie seemed to be quite unique and I even found rather amusing with the arrival of the man and woman to their house. There was a bit of intriguing mystery as well. Then the movie tone was a bit lighter for a while. But in the final third of the movie, it become rather insane, very very violent and too weird to my taste, especially towards the ending. Luckily though, the final scene which concluded the movie was satisfying for me as it made me feel we have come full circle. Since this movie was a psychological horror (I personally felt it was more like a psychological thriller), there was no supernatural being that haunt us and there was no jump scare scenes to scare us either. It was a slow kind of movie that build up towards the intensity of the finale. As I said above, due to my knowledge of the movie, I was not having the expectation of being scared silly like another movie I just saw last week Hereditary which I think was inaccurately promoted as the scariest movie, giving false hope. Anyway as a film with this kind of genre, I personally felt that it was able to produce the intensity and suspense during the first half. But the weirdness towards the climax totally lowered down my satisfaction. Overall, I can definitely see the appeal of this movie to the critics as it felt a bit artsy, but I can also understand the general audience' dissatisfaction of it. In this case, I consider myself as being in the middle as I could appreciate the uniqueness and of course the finale scene (which I thought was good), but I totally dislike all the illogical weirdness. This movie was directed by Darren Aronofsky who was known for directing few critically acclaimed movies & sometimes disturbing ones such as Requiem for a Dream, The Wrestler, Black Swan or his biggest hit Noah. So if you are interested in looking for such kind of film and if you are Indonesian and wanted to see this one on TV since it did not play in theaters back then, you can certainly give this one a try. It is currently playing in HBO Asia and you should be able to watch it any days during this week. But if you do not like this genre or if you prefer not to be bothered with too much weirdness, then probably you can skip this. The choice is yours.